I'm also proud to note that my short play Foodies! The seas are dry; the continents have become great dust bowls. Humanity has survived by settling on the sea beds, protected by great earthen berms — the levees — constructed and left behind by previous generations. Not only do the levees provide protection from the continental winds, they have also been repurposed into highways for a population that commutes on tractors and ATVs from the sprawling suburbs to the town of West Atlantis. Darren Dwyer is a 20 year old under-achiever who is grappling with the reality of post high school workaday existence. Lori Fitz-Palin is starting her junior year at Sargasso State. A chance encounter leads to romance and draws them both into a subversive plot with unknown repercussions. The complex choices that Darren, Lori, and the rest of the characters make as they navigate the rapidly-changing landscape are both hilariously ironical and deeply philosophical. The Levee is YA-friendly, all ages recommended! It is the perfect book for our times, an allegory of the choices that we all must make as we navigate the changing environment around us. In a world where water has mostly vanished and people are paid by the vialful, we meet Darren a not-very-motivated young man. Reconnecting with a high school sweetheart, he finds the world around him is not what it seems. Author Norko paints a grim future, but there is hope in this dry, desiccated place. The book moves quickly and Darren is an interesting blend of hope, laziness, despair, angst... A pretty typical twenty something who is trying to find a reason not to give up. Much of the time he seems to move in reaction to events around him and generally does not act as the catalyst. The book was well written, and I enjoyed reading it. And don't forget to check out the FREE PREQUEL to The Ghost Writer and The Ghost Cop! As a writer myself, I was drawn to this book because of the title. I learnt from the synopsis that it was about a man determined to write even though he was dead and thought it sounded right up my street. What I ended up with was a charming and heart-felt story about pursuing your dreams no matter what the cost and, at the end of the day, standing up for what is right. The plot is straightforward, but considering the novel is only short, it needs to be. Arnold is satisfied with his lot in the after-life but finds the corporation he works for isn’t as clean as it seems. Joining forces with other ghosts, he seeks to get the word out to ghosts and humans alike. The characters were charming. Arnold is your typical nice-guy, who was down on his luck while he was alive but has the chance to make something of himself once he has passed on. Arnold is determined to succeed and is driven for success. But he is also friendly, letting himself be befriended by both Clarisse and Manny. Unfortunately, it’s just hard to know which ghost you can trust these days. Despite being a lovely story, there is still tension and a fast pace to the plot. When Arnold finds himself under investigation, his subsequent hide-outs (in a wall and in a deer) add to the chase and Arnold himself finds his bravery when the deer are confronted with danger. For a character who is dead for the whole novel, he progresses and grows and the reader wants Arnold to be able to make a difference just because he is trying so hard to understand. The Ghost Writer was an engaging and enjoyable story that leaves the reader with a feel-good vibe and a smile on their face. It is a story full of messages, mainly about never giving up and pursuing your dreams even if you are, in fact, dead. It is also a tale of friendship and loyalty and doing the right thing regardless of the risk to yourself. For a short story, this one packed a powerful punch. The Ghost Writer is great whether you are a writer or not. The perfect book for a rainy day, a definite recommendation from here. I couldn't help but to re-read the book a second, and even a third time to flirt with the idea of a productive after-life that can truly make an impact on this life. If you're ready for a fresh, and original approach to the paranormal, then I highly suggest the Ghost Writer. ​Analytical, thought provoking with a taste of regret, the Ghost Writer will challenge those who read it to live their lives to the fullest. 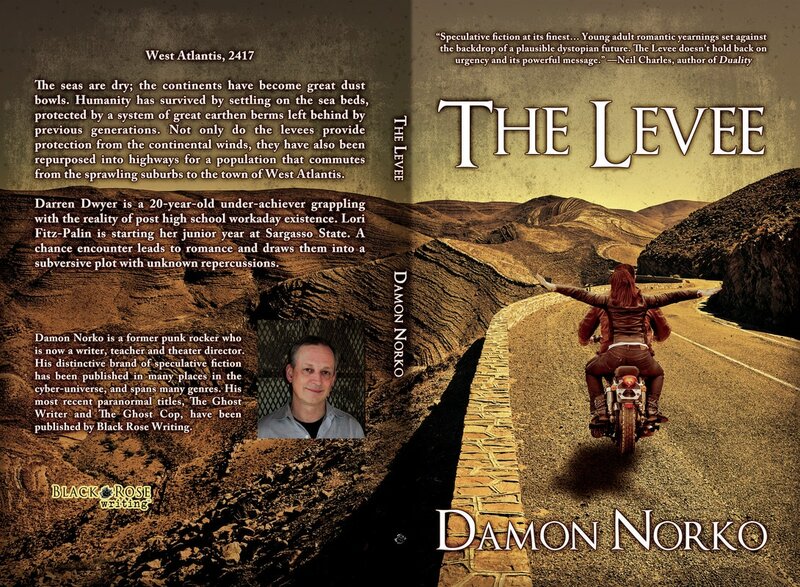 Then again, using your after-life to fulfill all those things you took for granted while still alive, Damon Norko presents his readers with a unique spin on what exactly is waiting for you when your time finally runs out. Arnold, wannabe writer in life, actual writer in death. We follow him in a journey of self rediscovery initiated by another very young ghost Clarisse. The whole tale is poignant and strangely comforting, my only criticism is that it was over too quickly. An interesting take on life after death. This was a great story line and the concept of a ghost writer is fantastic I really enjoyed it and didn't want it to end well done. A very different angle for a ghost story. The protagonist, Thad Springer, was a Detective in life, and is a Ghost Cop in the afterlife, investigating the supernatural while looking after his (living) family. Norko is eloquent in expressing the love of a father for his child, and leaving the reader wondering about what comes next, spiritually and literally. Imagine a world where the paranormal is considered normal, where ghosts have purpose and continue to survive in the physical world. They follow human rules (at least some of them) and have the same insecurities and needs as we do. In fact they seem to go an extra mile oblivious that they are actually more powerful. This story is about an ex-police officer (Thad) or should I say current officer who chooses to continue to serve and has a deep connection with his family. His assignment soon becomes the search for a ghost who seemingly has broken the rules (but this is treated in a new way by the author). There is intersection in terms of genres between supernatural and borderline science fiction. I am guessing the author loves both areas and has intertwined them here. The language used in the book is a welcome relief and it’s good to see authors using the mechanics of the language to convey meaning rather than foul rants. Words lent themselves to pictures and moving imagery with this book. The names of the characters and their treatments are original. The book is of good length as well. My only comment would be that it would be great to intersperse more dialog between the long narratives from the main characters voice and perhaps a little more backstory on the origins of the ghost cop. The plot in this story was very inventive. It was actually so interesting that I read the whole thing in one day. I could see this being made into a movie. The author did a great job! A fun sci-if story with a ghost twist. Enjoyable, Easy, quick read. Looking forward to further books in the series. Thad Springer is a ghost cop who investigates paranormal activities committed by fellow ghosts. In the course of his latest cases, which also involve his precocious young son, he may have uncovered the secrets of the universe. Yet Thad’s employer, the dynastic Orpheum Corporation, has other plans. However, in haste to control man’s destiny, the Corporation may have overlooked some fundamental truths. Follow Thad as he unravels the plot and finds out more about himself, his son, his wife, and what it is about Life that is really worth living. The Ghost Cop is a science fiction epic that takes the reader as far outward as it does inward.